The All Sky Camera is made by Santa Barbara Instruments Group (SBIG). The camera is an astronomical camera mounted in a weatherproof enclosure with an acrylic dome for the camera lens. The camera lens is a fish-eye type to give a full view from horizon to horizon. 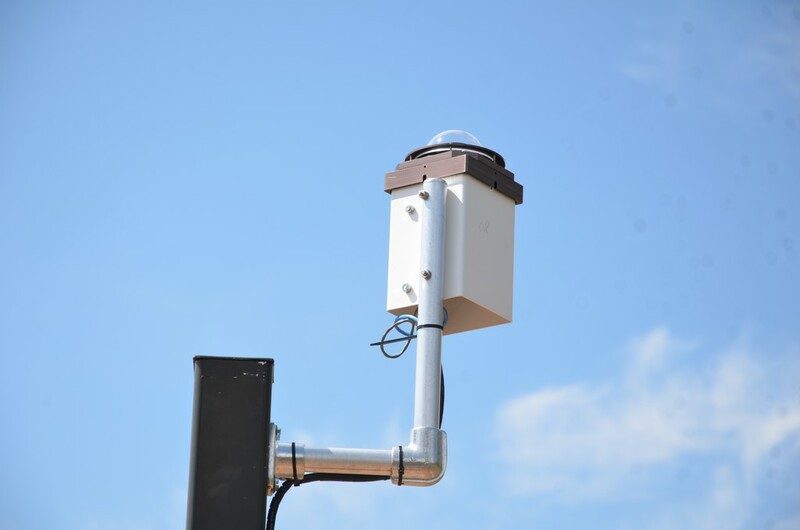 The camera is permanently mounted on the weather telemetry pole and takes a photo of the sky every minute or two. Images are downloaded to the DarkCloud Weather server and uploaded to the internet to this web site for viewing. The All Sky Camera is updated frequently and the images show the night sky including stars, the milky way and consellations. The All Sky Camera is oriented to correspond with star charts. This assumes you are looking up at the sky and North is at the top of the image, West is to the right of the image, East is to the left of the image and South is to the bottom of the image. An example image from the All Sky Camera is shown to the right. You can see the Milky Way and related constellations. The observatory dome is on the right side of the picture, or to the west.